• Always read, understand and follow the Instruction Manual before attempting to use any power tool in any way. Also read the nameplate information and follow the warning labels on the tool itself. • Always wear safety goggles or safety glasses with side shields. Use a dust mask for dusty operations, and wear hearing protection if you’ll be using the tool for an extended period of time. • Dress right, and remember that looks don’t count. No loose-fitting clothing, no neckties, no jewellery, no dangling objects of any kind. Long hair must be tied back out of your way. Non-slip footwear is recommended. 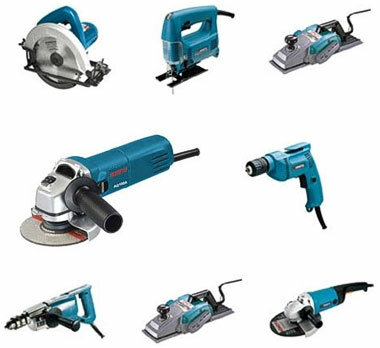 • Never use power tools if you are tired, sick, distracted, or under the influence of drugs or alcohol. • Make sure your work area is neat and clean and free of any debris that might get in your way or be ignited by hot tools, chips or sparks. • Make sure your work area has plenty of bright, shadow-free light. • Before you plug in any power tool, make sure the power switch is off. • Be sure all appropriate guards are in place and working. • Always turn off and unplug the tool before you make any adjustments or change accessories. • Never use any accessory except those specifically supplied or recommended by the manufacturer. They should be described in the tool’s Instruction Manual. • Never use power tools in wet or damp conditions. • Never use a tool that is damaged or malfunctioning in any way. • Need an extension cord? Make sure it’s a heavy duty cord and don’t use indoor rated cords outside. • If the tool has a three-pronged plug, make sure you use a three-pronged extension cord plugged into a three-pronged outlet. • Make sure cutters or blades are clean, sharp and securely in place. Never use bent, broken, or warped blades or cutters. • Never overreach when using a power tool. Stay firmly planted on both feet. • Never rush what you are doing. Always pay close attention. Don’t let anything distract you. Think ahead! • When using hand-held power tools, always keep a firm grip with both hands. Losing control creates a hazardous situation. Do not use any tool that is too heavy for you to easily control. • Always use the right tool for the right job. No substitutions allowed! • Always unplug, clean and store the tool in a safe, dry place when you are finished using it.